1) It is beautiful all year round with deeply ridged lime green leaves unfurling in late April, turning mid green in summer, yellow in autumn and then a lovely coppery colour throughout winter. 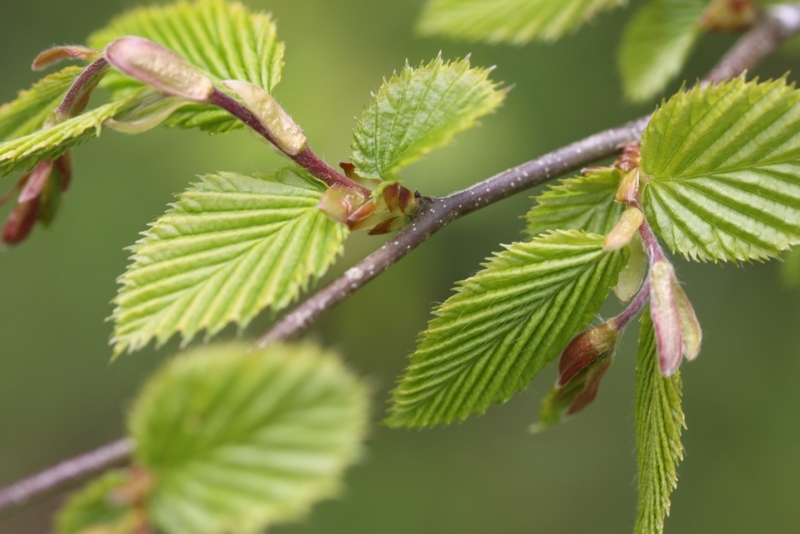 2) Hornbeam likes our heavy clay soil … It won’t grow where the ground is permanently waterlogged but it does cope very well with wet ground and it is very hardy thriving in cold and exposed windy situations. 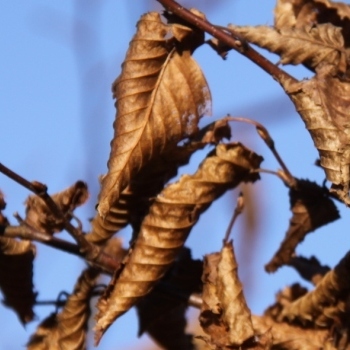 3) Garden birds such as blackbirds, wrens, chaffinch and thrushes like Hornbeam hedges for nest sites and as a good supply of food… moth caterpillars often feed on Hornbeam leaves. Hornbeam is a deciduous tree. They are available as bare root hedging plants from all good nurseries or garden centres throughout the dormant season from mid autumn until late winter – October until the end of February. These young plants are known as whips and are usually sold in bundles of 25 for around £1 each. It’s easy to plant a bare root hedge. Most gardening books will advise you to prepare the ground for your new hedge by killing the weeds, digging a strip 60cm/two feet wide and adding plenty of organic matter before planting a double row of young trees. Now that is a lot of hard work, especially if you are planting a long hedge and usually it is just not necessary. All you need to do is make a slit in the ground with your spade and push the roots into the earth. Firm the turf back in place with your feet and plant the next one about 60cm/two feet away. Despite all the advice to the contrary there is no need for a double row. Young Hornbeam plants establish quickly and will produce a good hedge in just a few years. As the trees grow they will naturally shade out any grass and plants growing close by without you having to resort to chemicals. Let your hedge grow to the required height … somewhere around five or six feet /1.5m – 1.8m is perfect for most gardens. Trim the hedge once each year in mid to late summer – July or August. The twiggy prunings are perfect for use in your borders to support flowering plants.